The online mattress industry has been recognized mostly as an all foam “bed-in-a-box” industry. However, Saatva has a different approach when it comes to this model, and has from the start. They are not only creating their wonderful, ultra-premium coil on coil mattress. They are also providing customer service that is unbeatable. 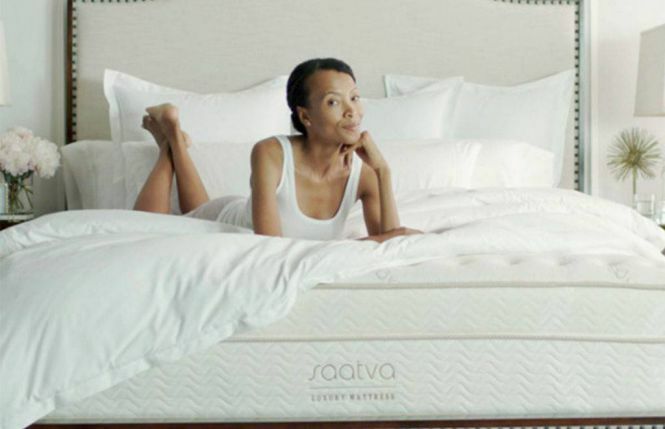 In this Saatva mattress review, you will get a taste of what real luxury is about. Latest Saatva Mattress Coupon – Found HERE! The Saatva is available in three different feel preferences that you get to choose. It is then constructed with the highest quality materials. This makes for optimal support and pressure relief too. They then continue to keep the buying experience as easy and efficient as possible. By delivering and setting up your brand new mattress through a white glove delivery service. This not only allows for an easy experience for you but also doesn’t compromise the design and integrity of the materials in the mattress. The Saatva bed not only has multiple comfort options but also is available in two thicknesses. There is an 11.5″ mattress as well as a 14.5″ mattress. This allows for you to choose if you would like a thinner or thicker mattress without changing the feel. This mattress will also be naturally cooler. With its coil on coil system, minimal heat is retained and can dissipate easily. The Saatva mattress also uses individually wrapped coils to make sure there is minimum movement felt. They even go as far as including dual foam encasement. This creates a solid mattress that is fully usable with ideal edge support. 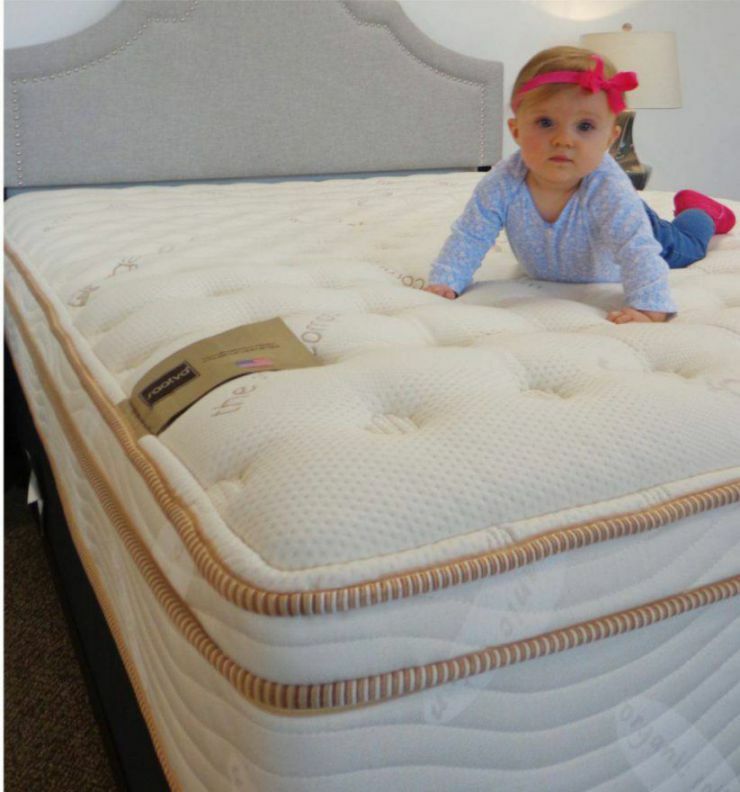 The Saatva mattress also includes a 15-year warranty and 120-night sleep trial. If you like a traditional coil mattress that will check all your boxes, then this mattress is for you. Saatva has also extended their brand to include two other styles of mattress too. The Loom and Leaf is their answer to an amazing memory foam mattress. 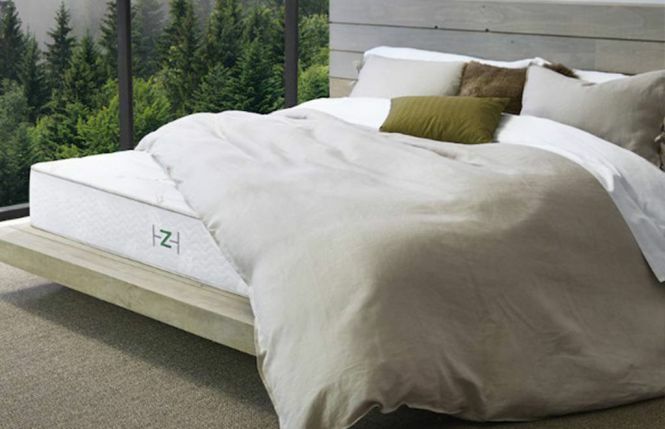 As well as the Zenhaven, a 100% Talalay latex mattress. All three Saatva beds are premium mattresses with the highest quality and durable materials. They also all include their white glove delivery service. In one fell swoop, your new mattress will be set-up, cleaned-up and you can even have your old mattress remove. You can’t go wrong with this brand! Learn more in our Loom and Leaf review and in our Zenhaven review! Below we have our in-depth & comprehensive Saatva mattress review. We will go through how it performs for off-gassing, comfort, motion transfer, sleeping cool, edge support, value, material, trial, and warranty. The Saatva brand offers a unique and premium service for delivering their mattresses. Instead of compromising the materials by roll packing their bed, they use a white glove delivery service. This free and very customer centric service allows for minimal off gassing and a great service to anyone who buys a mattress. This USA made bed will be hand delivered and set up for you. The typical two person delivery crew will schedule a delivery that is convenient for you and than take care of all the work. All you have to do is enjoy the end result. This is not only great for the integrity of the mattress but also results in less noxious odors. The bed may need to breathe for a few minutes once set up, but will have noticeably fewer off gassing fumes than most roll packed mattresses. Saatva is a very encompassing brand. Along with their line of mattresses they also offer other products that coincide with your bed purchase. The have a selection of foundations to also choose from. Including their adjustable bed, the Lineal Adjustable Base. Otherwise this mattress will need a foundation that provides a flat, even surface that will support the weight of the mattress as well as the sleepers. It also will need to be the right height for you as well as be aesthetically appealing. The Saatva would work great on a box spring with or without a frame, an adjustable base, a platform bed or slatted bed. Buy The Lineal Adjustable Base & Saatva Mattress HERE! 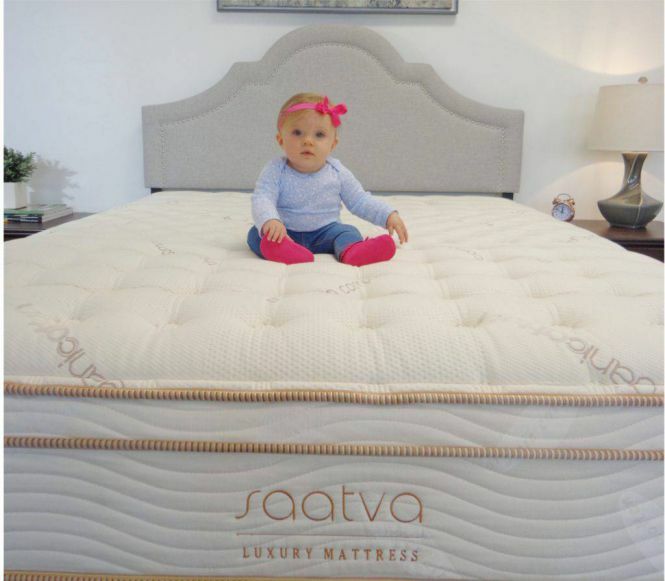 The Saatva mattress comes in three comfort levels, plush soft, luxury firm and firm. Out of these options the most popular is the luxury firm. It is going to be the closest to a medium feeling bed and best for all sleeping positions, sizes and shapes. It also is going to be a great compromise of proper support and ideal comfort. The luxury firm feel would be perfect for back, stomach and even side sleepers. It is supportive and has a solid core, yet is flexible and adaptable and offers the perfect amount of plushness. On a firmness scale this choice would all right around a 5.5 to 6, with 1 being the softest and 10 being the firmest. The plush option will be the softest choice and more than likely is going to be most ideal for dominant side sleepers. It is also great for back sleepers who like a softer feel too. This option doesn’t compromise support, but the foams have a bit more give to allow you to feel more cocooned. This is a perfect choice for someone who likes to have more contour and will fall around a 3 on the firmness scale. If you are a dominant stomach sleeper or like a denser, firmer feel in your mattress than the firm option would be great for you. This bed is very supportive and ideal for someone who likes to be more on the surface of the bed. This denser foamed mattress will come in around an 8 on the firmness scale. If you are a heavier person, than the luxury firm and firm would be the best choices. This dual coiled system bed has ample support and makes it great for larger sleepers. The foams are dense and durable and will last the long haul. The comfort options may feel a bit softer, but not by much making it a perfect choice if you are heavier. Having these three options really allows for you to find what will work best for you. Also, another unique feature of this mattress is that it has two thickness options. A 14.5″ mattress and an 11.5″ mattress. Both are going to have the same luxury feel, but just a different aesthetic. Now lets go into more detail of this Saatva Mattress Review by sharing our personal Comfort experience with this product. We tried the Saatva in the most popular option, the luxury firm and really enjoyed it. This innerspring mattress has a great feel that will appeal to a wide range of people. If you aren’t a fan of all foam mattresses and like the traditional feel of coil mattress, this is a great choice. We found that the coil on coil system does a great job of providing plenty of support as well as the layer of memory foam allows for lots of pressure relief and great spinal alignment. The luxury firm was a great compromise for us. It worked well for every sleeping position and had just enough cushion to cradle you while side sleeping yet still feeling plenty firm for stomach sleeping. Latest Saatva Mattress Discount – Found HERE! This mattress had very little motion transfer that we detected. Naturally a coil mattress may have more of a spring to it, however, the Saatva’s top layer of coils are individually wrapped. Doing this allows for the feeling of any vibrations to be greatly reduced and softened. This mattress also has a layer of memory foam just above the layer of comfort coils that adds additional comfort but also absorbs any vibrations that aren’t already eliminated by the wrapped coils. The top cover also has a euro pillow top that is going to be add a nice cushion and this too will help in eliminating or minimizing any disturbance to your partner. The motion transfer of this mattress is very minimal and general movements and shifting should be hardly noticeable, especially if you are sharing a mattress. If you are a warm sleeper and this is a concern for you this mattress shouldn’t be a problem. The Saatva mattress has a coil on coil system, and like all coil system mattresses the springs will create a layer of support that is also very breathable. By having not just one buttwo coil systems makes the air flow even greater and allows for heat to dissipate, opposed to getting trapped. Having the coil system directly under the layer of memory foam will help any heat that can sometimes be retained by the foam a chance to escape as well. Additionally, having a plush euro top with an organic cotton cover on the surface will add extra cushion. As well as a breathable barrier that will give some separation from the memory foam. Another thing to note if you are a warm sleeper is the fact that you may prefer the luxury firm or firm option. A softer mattress will increase the amount you sink in. And this will increase the amount of heat retained. While sleeping on the Saatva mattress we had no problems with sleeping cool and felt comfortable throughout the night. The Saatva mattress has a dual perimeter foam encased edge support system around the bed. This encasement creates a very durable and usable sleep surface from edge to edge. Sleeping close to the edge you shouldn’t notice any difference in how the mattress feels from the middle. Also having this extra stability around the edge gives the mattress added support if you sit on the edge of your mattress. Ideally you don’t want to treat the edge of you mattress like a chair, since this isn’t its intent. However, this mattress will hold up very well from typical daily use. The ability to not compress and roll this mattress up to fit in a box really allows for more durable materials. In turn this will just increase the quality and longevity of your bed even better. The price of a queen size Saatva is $1099. This price also includes a 120 night sleep trial and 15 year warranty. This mattress also comes with FREE white glove delivery service. This is a HUGE perk, considering the mattress will be hand delivered and set up for you. As well as including the removal of your old mattress and box spring too. We feel that this mattress is an amazing value. Especially when you consider what is on the market for the same price. It uses durable, high end materials that will create a long lasting and comfortable sleep surface. Saatva Mattress Discounts & Promotions – Found HERE! The Saatva mattress is available in two height options. The thicker profile is 14.5″ while the thinner profile is 11.5″. Both of these mattresses use the same materials and will feel the same but are different for aesthetic reasons as well as functional. The top layer of this mattress is a 2.5″ euro style pillow top. This comfort layer is built right into the cover and creates a nice soft, plush feel. Under the top layer is a 1″ layer of lumbar support enhancement made of memory foam. This layer is another comfort layer that specifically helps alleviate pressure as well as any stress of tension in the lower back. Next is the first set of coils. This coil system is made of 884 (in a queen size) individually wrapped coils. These coils are made to respond and contour to your body. They are a layer of support as well as comfort and create an ultra-luxurious feel. The steel coil base support system is made of 416 (in a queen size) Everflex coils. These hourglass shaped coils create a long lasting, durable solid core that prevent sagging. They provide great support for your body as well as maintain the foundation of this mattress. Around the exterior of this mattress is a dual perimeter edge support system. This solid encasement system allows the mattress to provide a durable and fully usable edge to edge sleep surface. It not only protects the coils but also gives a solid yet uniform feel for the sleeper as well. All of this is under a soft and breathable 100% organic cotton cover. This cover holds the euro-style pillow top smoothly to the rest of the mattress. As well as creates a nice clean look while adding an additional layer of cushion and comfort. This cover has an aesthetic that looks similar to all the Saatva brand covers. It is natural and soft and makes for a beautiful and comfortable mattress. The Saatva mattress has a 120 night sleep trial period. This is about 20 days longer than the average trial periods of most mattresses. It certainly gives you more than enough time to try this bed it. If it isn’t for you, Saatva will work with you to make the return process as simple and easy as possible. This mattress also comes with a 15 year warranty. This also is 50% longer than the average industry standard warranty/ This really proves the quality and durability of this mattress go the distance. 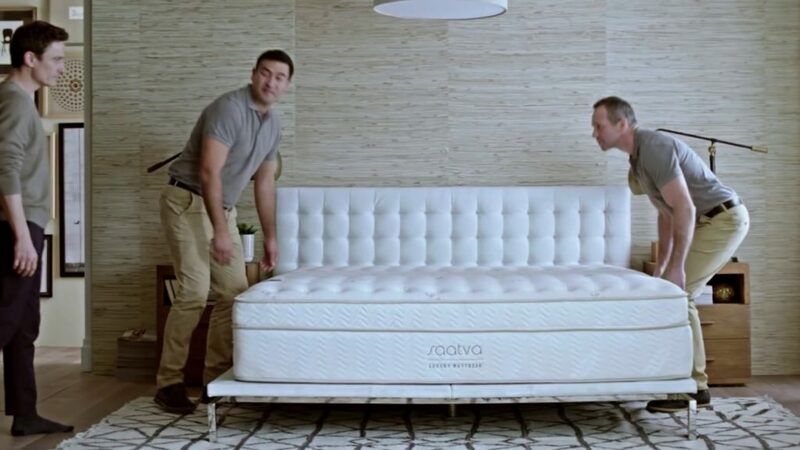 It also shows that Saatva truly stands behind their mattress. If you are looking for more specifics for the Saatva Warranty or Trial find out more at Saatva.com or for a helpful tool check out Our Mattress Warranty & Trial Period Guide. 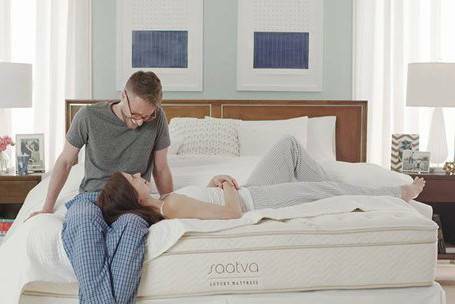 Best Saatva Mattress Coupon – Found HERE! “Let me just start by saying that I am greatful there are still amazing products such as Saatva being produced right here in our great country. Secondly My wife and I just received our Saatva bed yesterday and I must say the first night sleep was probably the best sleep I’ve ever had.” – Jon P.
“I have had back problems for many years. After sleeping on the Saavta Plush Soft mattress since February, 2014, my back problems have disappeared. I would highly recommend this product. The customer service is outstanding!” – Maureen D.
Also, remember Our Sleep Guide is here to help and make sure you find the best mattress for you! Customer Feedback: We hope you this Saatva Mattress Review has equiped you with what you need to making your next mattress purchase. If you have questions or need more insight during your mattress buying journey, please feel free to contact us. The Saatva mattress is one of the best out there. Not only do you get great comfort, but optimal support, durable edges, a cool surface and years of quality sleep. Regardless of your size or shape, this mattress will work wonderfully for you. You want a solid, well constructed mattress with durable materials that won't break the bank. Still looking for some more information? Visit Saatva at saatvamattress.com. Also, have questions for us? Please contact us and we would be happy to help you!